Those of you who followed the first person shooter genre back in 1998 probably vaguely remember a game called Prey that was in development at 3D Realms. 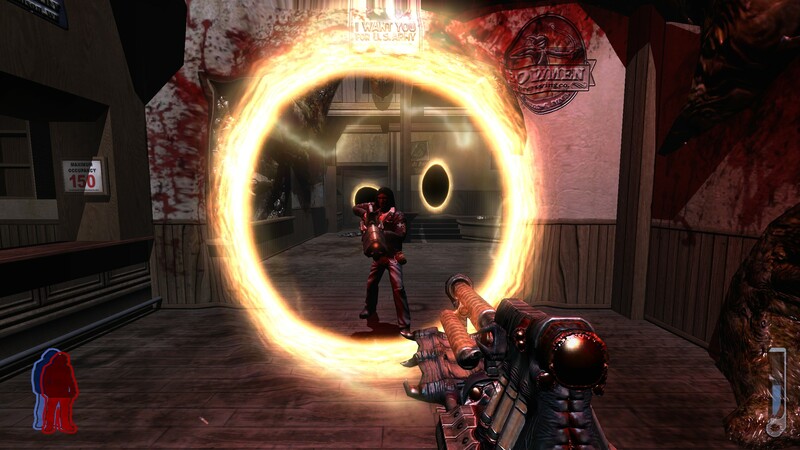 The game featured a Native American theme and a unique portal technology that allows enemies to appear out of thin air among other things. Then the game suddenly disappeared for years only to recently resurface. This new game, developed by Human Head Studios, features many of the original ideas from 1998 as well as a state-of-the-art graphics engine and fierce combat. The amount of hype surrounding the game when it was shown at E3 was enormous. Luckily, Prey manages to deliver a solid and compelling first person shooter experience. Prey opens with the main character of the game, a Native American named Tommy, talking to himself in a bathroom mirror. He wants to take his girlfriend and leave the Indian reservation. She on the other hand doesn’t want to leave. While trying to talk her into leaving, his girlfriend and his grandfather are sucked up into an alien ship. Tommy manages to get free and then sets out to rescue his girlfriend. Of course along the way he will end up saving the world. The plot in the game is actually pretty solid. The game starts out pretty intense and things rapidly escalate and get pretty desperate. It also does a pretty good job of explaining why you of all people are the one who has been chosen to save the world. While the Native American influences are not a major part of the gameplay, it is an interesting and recurring theme in the storyline. 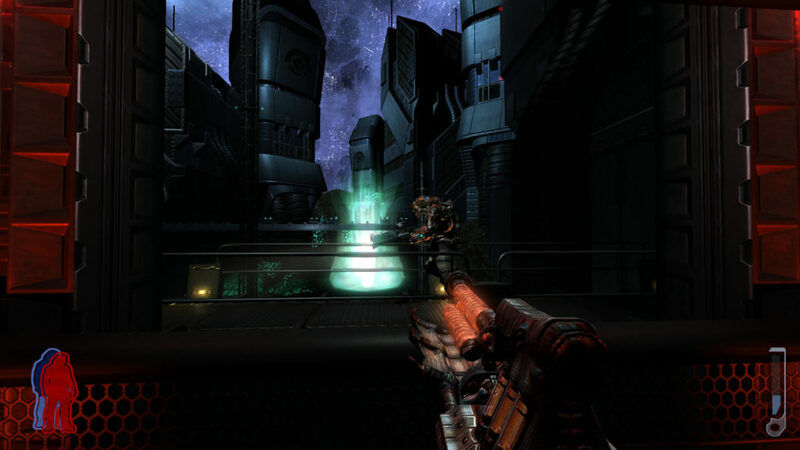 The last few levels in the game make up one of the most intense climaxes to any first person shooter in recent memory. The ending also leaves you feeling pretty satisfied, which is a relief considering many high profile games have had disappointing endings recently. The whole game will take most people between 8 to 12 hours. Along with a compelling plot, the game features amazing visuals. 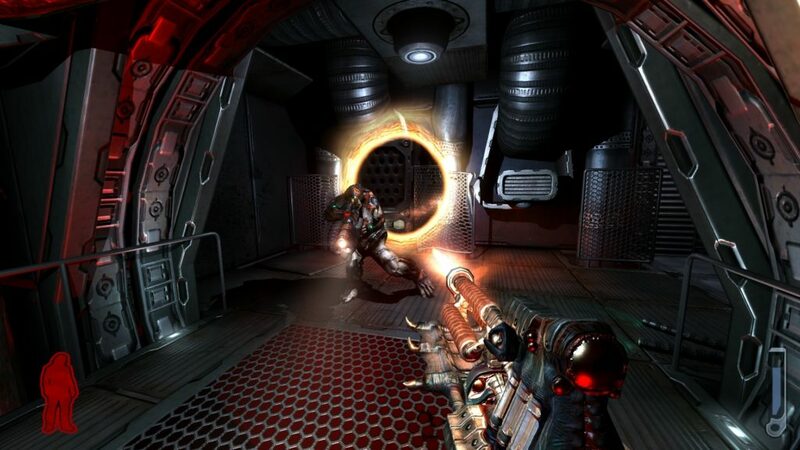 The game is powered by the Doom 3 engine (which also powered Quake 4). 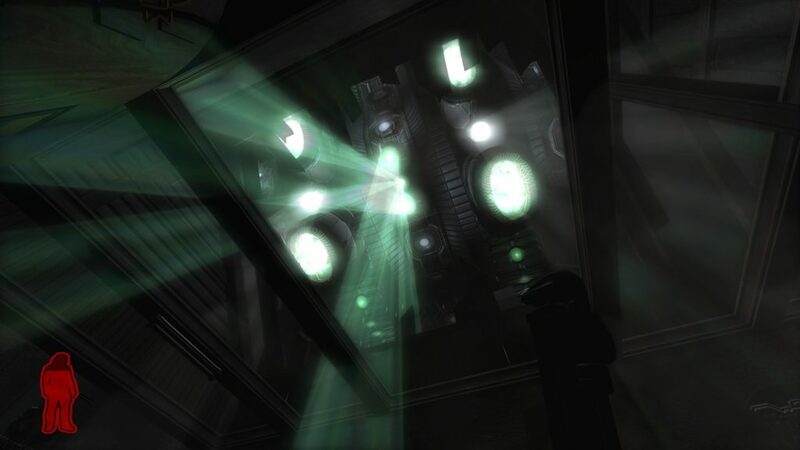 So the game features completely real-time lighting and shadowing and interactive GUI surfaces (control panels) like those found in Doom 3 and Quake 4. The engine has also been modified to provide other great looking effects like light bloom. The environments themselves are very detailed and are constantly animating. You really get the feeling that you are in a living spaceship. In a way, Prey has fallen victim of its own hype. The biggest complaint that most will have with the game is of its use of portals, gravity manipulation and spirit walking. Many were expecting some revolutionary new gameplay mechanics because of these three things. Unfortunately their use doesn’t do anything to drastically change the way first person shooters are played. But even though the game comes pretty short of “revolutionary”, the portals and gravity manipulation keeps the game pretty fresh throughout, which is more then what other first person shooters offer these days. So while it doesn’t reinvent the first person shooter, those gameplay innovations keep it from tasting stale. The portals serve a couple of purposes. First, they allow you to move from one 3d environment to another seamlessly. Second, portals provide an interesting and fresh way for enemies to enter the environment. 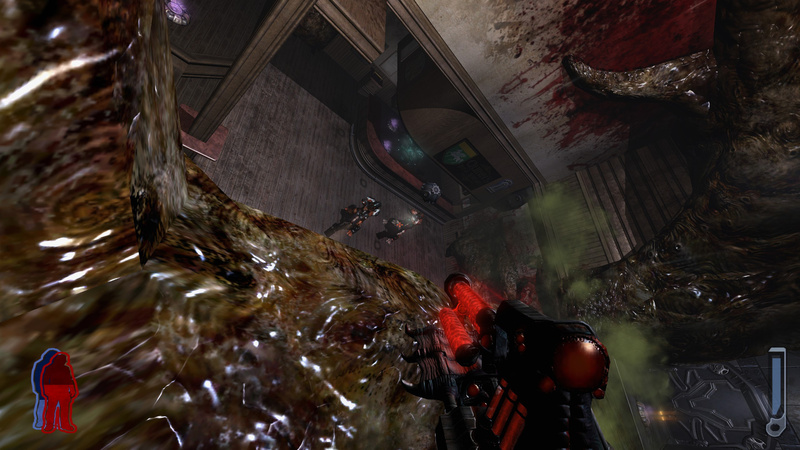 For example, sometimes enemies will portal in and be walking on the ceiling. Perhaps more interesting then the portal system is what the game does with gravity. In the game you will find glowing walkways that allow you to walk up walls and even completely upside down. Even more interesting is that sometimes you will walk around a corner and gravity will completely change directions. There are also times when you will walk through rooms you have already been in but you will be on what was previously the wall or the ceiling. This keeps the battles interesting as you will be shooting down at enemies that look like they are on the ceiling, but they are really on the floor. Also, in some rooms you will have the ability to change gravity by shooting wall panels. The portals and gravity are constantly used in combination for some fun (though not very difficult) puzzles. Tommy, because of his Native American heritage, also has the ability to leave his body and spirit walk. While in spirit form you can do things that you normally wouldn’t be able to do. For example you can walk through force fields and sometimes over large gaps that would have been impossible to jump. Unfortunately, most of these sequences boil down to walking through a force field and hitting a switch on the other side to turn it off. There are a few puzzles in the game when you have to leave your body someplace and then use your spirit to move you somewhere you normally would not be able to go. However, these types of puzzles are few and far between and don’t pose much of a challenge. Though you can fight enemies while in spirit form, which can be helpful when you are low on health. Since you have this spirit walk ability, when you die you are sent to the spirit realm. The spirit realm is basically a small mini-game where you must shoot down red and blue wraiths which recharge your health and spirit energy. After a short amount of time you are sucked back into the living world pretty much exactly where you died. The amount of spirit energy and health you have depends on how well you did in the mini-game. While this is pretty unique and interesting, it has the unfortunate negative effect of making the game pretty easy. You never have to worry about saving since you in essence can’t die. Perhaps it would have been better if you could actually fail at the mini-game. Prey has a pretty good selection of weapons. While your arsenal is actually pretty small, weapons have secondary functions. Some of the weapons are alien versions of familiar weapons while others are pretty unique. One of the weapons must be powered up at stations. How the weapon behaves depends on what type of station you powered it up at. The enemy designs in the game are pretty good overall. While there are not a ton of different looking enemy types, they all require different strategies to defeat. The AI in the game won’t win any awards, but it does a good job of keeping the firefights intense and fun. The audio in the game is pretty good. The voice acting is of pretty high quality. Unlike other games like Doom 3 or Half-Life 2, the main character in the game speaks a lot. The music score in the game, which is done by Jeremy Soule, is also pretty good. The only somewhat disappointing aspect of the sound design is the weapons themselves. While they don’t sound bad by any means, they somewhat lack the punch that you would expect. In the end, a lot of what you will get out of Prey depends on what you go in expecting. If you expect to find a revolutionary experience you will be disappointed. But if you go in with reasonable expectations, you will find a sold first person shooter with some interesting gameplay innovations that keep the game fresh and makes it stand out compared to other first person shooters.